Historical details on the major landlords and estates of Claregalway are scattered and difficult to come by—those listed below are sourced from various small publications. The unsual field patterns to be seen around Claregalway are a result of many years of land division and different land acts. If you have any other details, please feel free to add them below. The Earl of Clanricarde was the first to own and live in the present Claregalway Castle, which dates from the 15th century when it was built for Ulick de Burgo. Tradition has it that the castle was occupied by a Lord Dunkellin, whose barony bears his name. Originally it had a thatched roof which had been maintained by a local man by the name of Duggan. The adjoining lodge was once owned by a Mayo cattle-rancher by the name of Mellotte. The lands attached to the castle were divided among local tenants by the Land Commission as a result of the land agitation in the early 1900s, but the fishing and fowling rights were retained by the owners of the Castle. The last landlord to inhabit Claregalway Castle was Sir James Nelson, a millionaire horse owner, whose family owned the Nelson Shipping line. He came mainly for the shooting season. Lord Clanmorris’s family name was Bingham. By 1878, John George Barry Bingham, 5th Baron Clanmorris, was noted as having three addresses—Cregclare and Seamount in Co. Galway and Newbrook, Ballyglass, Co. Mayo. The last Lord Clanmorris lived in Cregclare near Ardrahan. Lord Clanmorris owned over 3,000 acres in Claregalway, Kiniska, Montiagh North and South, Curraghmore and Cahergowan-Summerfield. In the townland of Claregalway there was once a police barracks and also a chapel and graveyard. These he leased out to James O’Brien and to the Rev. John Burke and his brother Michael. 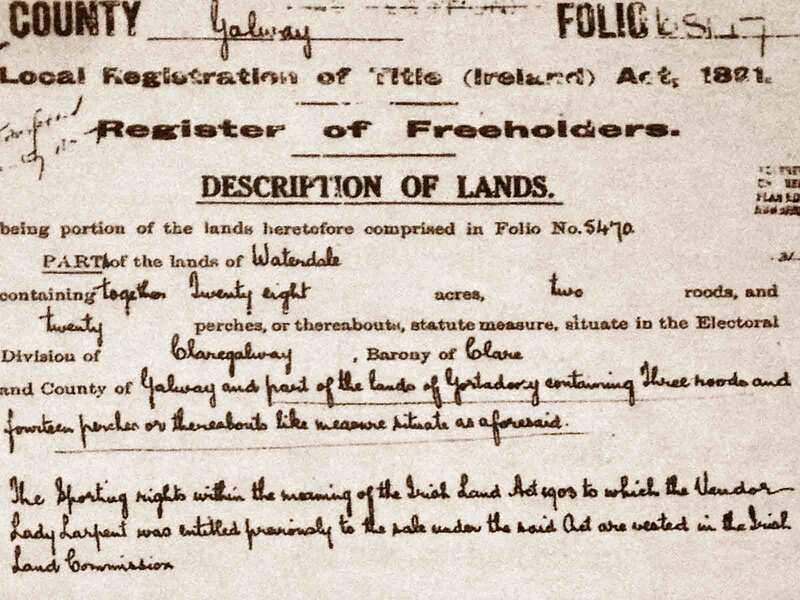 Lord Clanmorris sold the townlands in 1907. Valentine O’Connell Blake farmed over 1,800 acres in Carnmore West and Carnmore East. There is an interesting account of the occupancy of Waterdale House in the SMA Fathers’ publication, Claregalway Abbey. According to their research the house was built in the 18th century by a member of the Staunton family from Buckinghamshire, who had settled in Galway in the 17th century and married a member of the Lynch family. The entrance to the house was at Mullacuttra, close to the fort on the Loughgeorge/Corrandulla road. From Cregclare, Ardrahan, married Catherine Staunton, a granddaughter of the first settler James Staunton. Lambert owned over 1,700 acres in Gortadooey, Gortcloonmore, Mullacuttra, Waterdale and Cloughane. He gave a terminable lease of the house and the demesne [c.700 acres] to James Blake. Waterdale estate, 1,786 acres, which was heavily in debt in 1855, was saved from being sold off, because funds from the sale of other Staunton properties were used to “clear off the encumbrance” on Waterdale. In the early 1900s after the departure of Lady Lambert, with the house already vacant and falling into ruin, the lands were “striped,” chiefly among the tenants and workers of the estate. In the mid 19th century Andrew H. Lynch lived in Lydacan Castle and owned almost 1,700 acres of land in Lydacan, Caherlea, Gortatleva and Lissarulla. Patrick Qualter was caretaker of the estate. The next occupant of the castle was Martin O’Flaherty. He evicted some families in order to enlarge his fields and to let the land to better tenants. This incurred the strong anger of Fr James Commins, who was parish priest at the time, who preached a sermon against him in which he said that for a Catholic he was turning out as bad as Pollock. This made O’Flaherty disliked and feared. He was disliked for other reasons too. It was said that early in life he was a Young Irelander but that previous to the insurrection of 1848 he had fled to Australia or New Zealand to avoid taking part in it. He returned after some years having made some money. The circumstances in which he came into possession of the Lydacan property are said to be as follows. The estate had been in the possession of the Lynch family previously and the last of them, a Mrs. Lynch, who was known among the people as An tSean Mhaistireas, became impoverished and the place was put up for auction by the creditors—whoever they were. No one wished to deprive the lady of her home and those who might be expected to bid agreed tacitly at least not to do so. O’Flaherty, who was described as being a ‘hammer man’ at the auction, made a bid and the property was knocked down to him. These two circumstances, the way he acquired the estate and the fact that he was a renegade from the national cause, led to his being feared and also rather despised. Martin O’Flaherty sold Lydacan Castle to James Greated. O’Flaherty died c.1870. Mr Greated lived in the castle with his mother, wife and family. He seems not to have been popular with his tenants. The castle was burned in November 1922. James Galbraith owned over 1,000 acres in Lakeview and Cregboy. Two of his tenants, John Galway and Edmond Morris, acted as caretakers of the estate. There was a church in the townland of Lakeview, which was leased by Rev James Commons. Galbraith sold the land of Lakeview to Mr Holmes, another landlord, who lived in Rockwood House. The house and 99 acres of land were sold to Mr Fox in 1922 for £385 (according to local tradition), while the remainder of the estate was taken over by the Land Commission. It is said that Holmes handed in a “scraw” to the Commissioners, symbolising the forfeiture of his ownership of the estate. James Ffrench, of Rocklawn House, owned over 500 acres in Cloon and Pollaghrevagh. They were a Catholic family. Some of his tenants included Michael Kelly and his wife Winifred Crowe, who lived in Cloon and worked the land of Richard J Ffrench but eventually were evicted. Their cottage was burned down by Ffrench’s men while the family watched. The last of the Ffrenches—Eddie, his wife and sister-in-law—were boycotted in the late 1930s and early 1940s by locals, some of whom destroyed the house. The family was forced to live temporarily in a stable before leaving permanently. He owned close to 500 acres in Knockdoemore and Peake. Almost 300 acres in Rooaunmore and Loughgeorge were owned at various times by Dominick Browne and the Directors of the Alliance Company. His estate consisted of 98 acres in the townland of Kiltrogue.